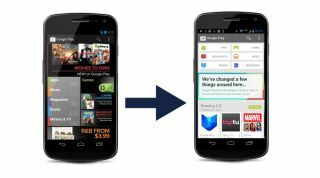 A Google Plus misfire from a quick-fingered Googler has revealed the next major redesign for the Play Store on Android devices. A post from YouTube employee Eileen Rivera (since removed) included the image of the new Play Store, which is apparently in the "dogfooding" stage of development -- where Google "feeds" its own staff the next flavour of the app for testing. In a cute reference to this, the Play Store app icon has been changed to a dog's bowl with Play services icons mixed up in the slop. The image gives very little away as to what new features or usability tweaks we can expect in the update, though. We're hoping for more detailed search options, with filters to improve results, but then, we've been hoping for a change like this for a while now.